How much money will you need in Tibet? ¥402 ($60) is the average daily price for traveling in Tibet. The average price of food for one day is ¥144 ($21). The average price of a hotel for a couple is ¥368 ($55). Additional pricing is in the table below. These average travel prices have been collected from other travelers to help you plan your own travel budget. An autonomous region of China, Tibet is known to be the highest place on Earth with the Himalayas and Mount Everest located right along its western border. The area has long been inhabited by Tibetans, whose culture remains strong and central to the place itself, deeply embedded in religion. Most visitors come to Tibet to trek the mountains and see its holy places, monasteries, and temples dedicated to Tibetan Buddhism. The countryside of Tibet is at the highest elevation in the world. The Himalayas gracefully sweep down its western border, while winding rivers snake through vast open plains. You can see a good sampling of Tibet's natural beauty at a place like Namtso Lake, the highest salt water lake in the world. Here, visitors and nomads enjoy the great plateau appeal of the lake with views of the snow-capped Thangula range in the north. While the natural sights of Tibet are an undeniable treasure, the region is most known for its holy places. Most of its cities, towns, and villages are centered on religion, with historic temples and monasteries being the focal point for all. Lhasa especially has many traditional buildings like Potala Palace which was home to the Dalai Lamas, Jokhang Temple built in 647 AD, the Summer Palace of the Dalai Lama, and Barkhor Street which is lined with traditional Tibetan architecture. Samye Monastery, located in the Shannan prefecture, is also an important site as the first Buddhist Monastery in Tibet, while Tashilhunpo Monastery in Xigatse is the traditional seat of the Panchen Lamas. And then there is Rongbuk Monastery, one of the highest monasteries in the world, from which there are stunning views of Mount Everest. Tibet is divided into seven prefectures which include its capital of Lhasa as well as Xigatse, Ngari, Qamdo, Nagqu, Nyingchi, and Shannan. Lhasa remains Tibet's holiest city, home to many successive Dalai Lamas at Potala Palace and a good number of monasteries and temples. 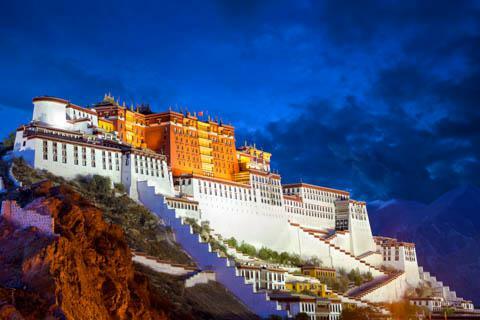 Over 1,300 years old situated next to a river, the city's name, Lhasa, translates as "Land of the Gods." Tibetan culture still thrives here, and you will often see locals engaged in prayer in traditional dress at the city's temples. Lhasa also has a bustling market where you will find locals and visitors alike bartering for items like Tibetan rugs, oil paintings, carved goods, woolen clothing, and other authentic handicrafts. In general most tourist activity is concentrated in five areas: Lhasa, Eastern Tibet, Western Tibet, Northern Tibet, and Yalong Valley. Most people come to Tibet to experience its old world aura of traditional culture, devout religion, beautiful temples and monasteries, and bustling markets. One could spend days admiring the grandeur of the surrounding mountains, or getting lost in the sights and sounds of everyday life in the villages. With the entirety of Tibet being the highest place on earth, one truly feels closer to the heavens, rising above everything else and experiencing new ways of seeing the world. If you seek a more guided understanding during your travels, there are many tour companies as well as local tour guides more than willing to share the world of Tibet with foreigners. Some offer tours of the region's hot spots, cultural sites and monasteries, while others cater to the surrounding countryside. Lhasa Gonggar Airport is the airport serving Lhasa, the capital city of the Tibet Autonomous Region, China. It is located about 61 miles south of the city. Domestic airlines using the airport can operate flights to Beijing, Chengdu, Shanghai, Guangzhou, Hong Kong, Chongqing, Xian, Xining, Kunming, Diqing, and Chamdo Region. One international airline connects Lhasa to Kathmandu, Nepal. Buses at the airport can shuttle visitors to downtown Lhasa, taking about 40-60 minutes. Tibet is also connected to other parts of China via railways lines. The Qinghai-Tibet Railway runs from Qinghai to Tibet with many stations in between including Delhi, Golmud, Amdo, Tanggula, Nagqu, and Damxung. The ride is very scenic, traversing plains, mountain ranges, rivers and lakes, grasslands, and densely populated cities. As far as roads go, there are four leading into Tibet which roughly correspond to the cardinal directions. All foreign visitors do need one or more permits to visit Tibet, so be sure to do your research on the necessary paperwork before setting out on your trip.